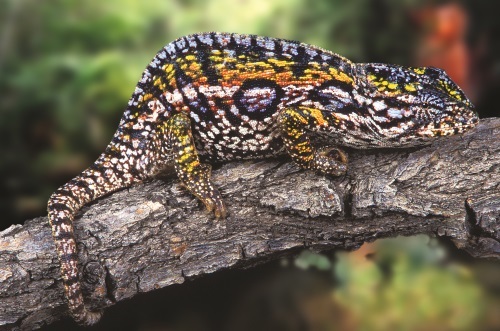 They live mostly in trees and eat mainly insects, although large chameleons can eat birds. Most chameleons grow to 17–25 cm (7–10 inches) long, while the longest can reach 60 cm (2 ft).4 Chameleons are sometimes insulted as ‘the most primitive group of lizards’,5 but they have many unique design features. Rather, they have a basic pattern that provides camouflage, and the colour changes are due to heat, light, and can also reflect their mood! For example, if a panther chameleon gets angry, then red and yellow replace its normal colour.6 Perhaps other chameleons recognize this as a warning to keep away? Many believe that the chameleon’s colour helps to communicate its mood to other chameleons—‘wearing its heart on its sleeve’, so to speak. One type of male chameleon, when he wants to attract a female, will change from brown to purple and light blue, with his eyelids turning yellow with green spots. How do they do it? They change colour with their highly structured skin. Underneath a transparent outer layer, there are two layers of red and yellow pigments, contained in cells called chromatophores. Below that are two more layers, one reflecting blue and another reflecting white. Deeper still is a layer of the dark brown pigment melanin contained in cells called melanophores.7 These are the most important for colour change, because they have ‘tentacles’ reaching into the upper layers. The colour changes when the cells expand or contract. E.g. a calm chameleon might look green when its yellow chromatophores are partly contracted, letting reflected blue light through as well. An angry chameleon may be yellow because the yellow cells are large enough to block the blue light from shining through.2 Yellow can also result when the blue layer is missing, allowing the white light from the next layer to shine through and brighten the other colours. The skin lightens when the melanophores pull melanin inwards. But when a chameleon is enraged, the melanin spreads into the outer layers and the skin may blacken. For the chameleon to focus accurately, the lens must form a large image on the retina. The chameleon’s eye produces the largest image of any vertebrate compared to its size. This is formed by an ‘astonishing’9 negative lens,10 likely ‘unique among animals’,9 i.e. it makes light diverge rather than converge. The chameleon can see a sharp image of an object from almost any distance away. That is, its eye can accommodate very well, so it can even clearly see an object just 3 cm (just over an inch) away. In contrast, in human vision, objects become blurry if they are closer than twice that distance. We really need objects to be 30 cm (1 ft) away before we can see them as clearly as a chameleon can. The chameleon needs this fine judgment of distance to capture prey with its tongue. This is another remarkable feature—the tongue can reach up to 1½ times the lizard’s body length. The chameleon needs this fine judgment of distance to capture prey with its tongue. The acceleration of this ‘ballistic tongue’ is amazing—50 g (i.e. 50 times the acceleration due to gravity), while astronauts and jet fighter pilots will pass out at only 10 g. The chameleon uses special supercontracting muscle, ‘unique among vertebrates’ and otherwise found only in invertebrates.11 This is necessary to produce the tension over the great changes in muscle length. How does the tongue accelerate so much? Even supercontractile muscle can’t explain that totally—it would need to generate 10 times as much power as it does. 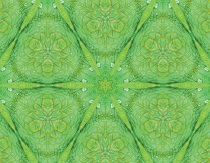 The chameleon’s highly structured skin seen magnified. The outer layer of skin is made of keratin, like the material in our skin and fingernails. Their skin does not expand as the animal grows, and requires shedding periodically. An adult sheds about every four months, while a baby approximately every few weeks. 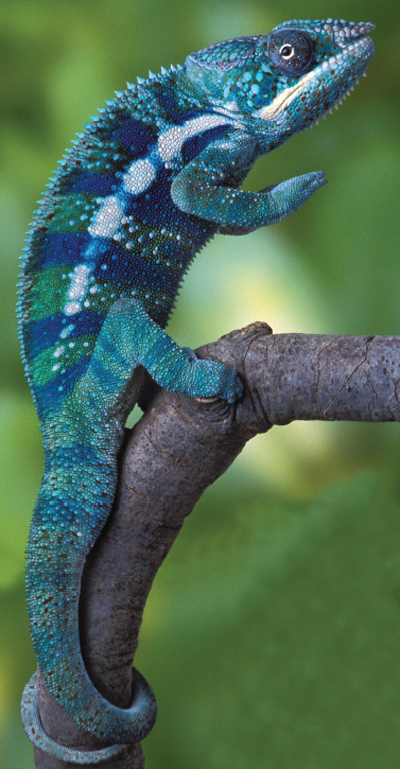 A chameleon’s skin usually looks green. However reactions to heat and cold, stress, shock and other stimuli may result in the skin appearing black, and may even create stripes and spots. One of the papers5 on the tongue’s design had a curious section, ‘Evolutionary considerations’. 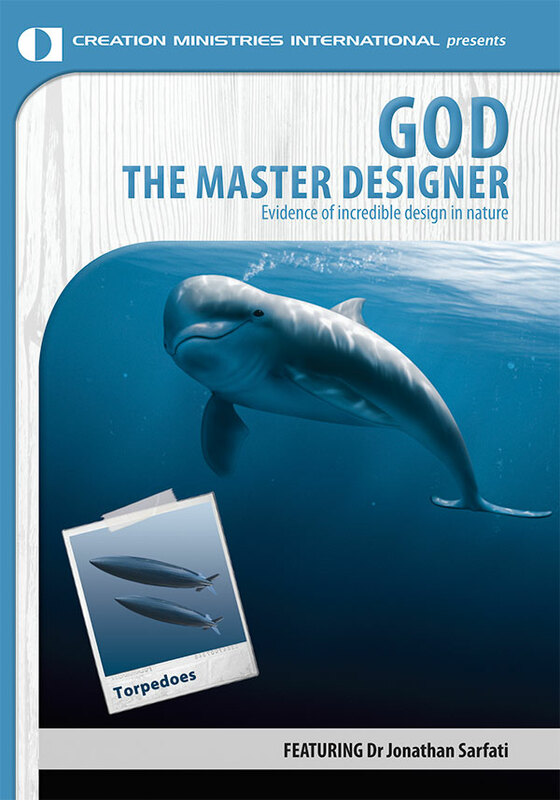 The author admitted that the suction cap and the ballistic tongue are both essential to capture prey, i.e. one is useless without the other. Yet he interpreted this as evidence that they must have ‘evolved simultaneously … early in their evolutionary history.’ A far better interpretation is that chameleons have always been chameleons, and were designed with both these mechanisms fully functional. The chameleon tongue has a bone, which provides the stiff frame. Surrounding the bone are at least 10 slippery sheaths. These contain coiled collagen fibres, which are the elastic material. The sheaths, in turn, are surrounded by the powerful accelerator muscles, providing the stretching energy. When the chameleon wants to flick out its tongue, it activates these muscles. Now muscle is incompressible, i.e. its volume remains the same. (For example, when you flex your biceps, the muscle contracts, and to keep the volume constant, it bulges outward.) In the chameleon tongue, the muscles squeeze inward, and to keep the volume constant they lengthen along the tongue. This stretches the sheaths like elastic bands. Schilthuizen, M., Slip of the chameleon’s tongue, Science Now, sciencenow.sciencemag.org, 8 March 2004. Müller, U.K. and Kranenbarg, S., Power at the tip of the tongue, Science 304(5668):217–219, 9 April 2004. 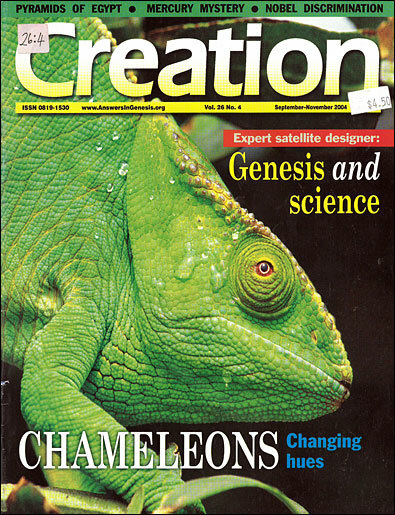 Article ‘chameleon’, Encyclopædia Britannica 3:69, 15th ed., 1992. Return to text. Raxworthy, C.J., A Truly Bizarre Lizard, The Living Edens, pbs.org, 20 April 2004. Return to text. 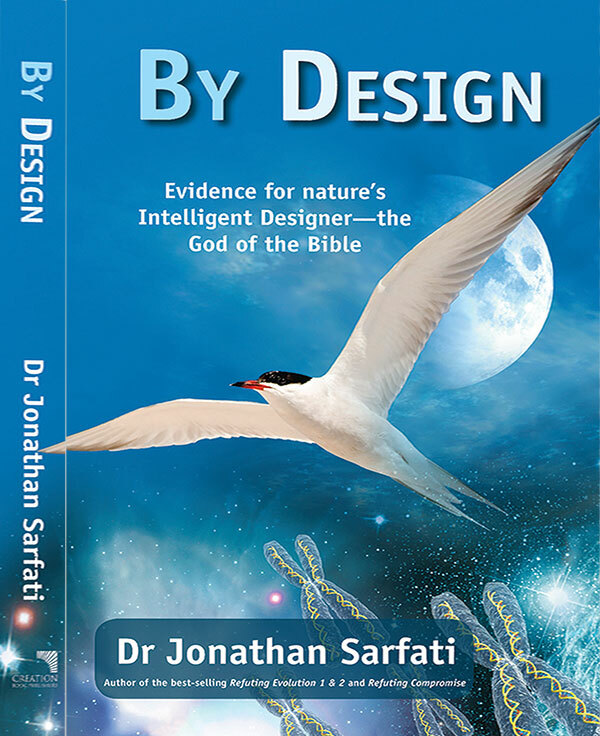 For explanation of biblical kinds, see Sarfati, J., Refuting Compromise, chapter 7, Master Books, Arkansas, USA, 2004. Return to text. They also have a unique ‘zygodactylous’ toe pattern, i.e. opposed bundles of two and three fused digits. Their teeth are attached to the jaw edge (called ‘acrodont dentition’). Return to text. Herrel, A., Meyers, J.J., Aerts, P. and Nishikawa, K.C., The mechanics of prey prehension in chameleons, J. Exp. Biol. 203:3255–3263, 2000. Return to text. National Geographic Explorer—Chameleons, magma.nationalgeographic.com, 21 April 2004. Return to text. Holladay, A., How do chameleons change color and how do they know what color to change to?, Wonderquest, wonderquest.com, 14 March 2001. Return to text. Telephoto lizard, Focus, Creation 19(1):7, 1996. Return to text. Land, M., Fast-focus telephoto eye, Nature 373(6516):658–659, 23 February 1995; comment on ref. 10. Return to text. Ott, M. and Schaeffel, F., A negatively powered lens in the chameleon, Nature 373(6516):692–694, 23 February 1995. Return to text. Herrel, A., Meyers, J.J., Timmermans, J.P. and Nishikawa, K.C., Supercontracting muscle: producing tension over extreme muscle lengths, J. Exp. Biol. 205:2167–2173, 2002. Return to text. Snelderwaard, P.Ch., de Groot, J.H. and Deban, S.M., Digital video combined with conventional radiography creates an excellent high-speed X-ray video system, biology.leidenuniv.nl, J Biomech 35:1007–1009, 2002. Return to text. Weston, P., Kangaroo rats, Creation 26(3):18–20, 2004. Return to text. Müller, U.K. and Kranenbarg, S., Power at the tip of the tongue, Science 304(5668):217–219, 9 April 2004. Return to text. de Groot, J.H. and van Leeuwen, J.L., Evidence for an elastic projection mechanism in the chameleon tongue, Proc. R. Soc. B 271(1540):761–770, 7 April 2004. Return to text. Trivedi, B.P., ‘Catapults’ give chameleon tongues superspeed, study says, news.nationalgeographic.com, 19 May 2004. See also Wieland, C., Evolution and practical science, Creation 20(4):4, 1998. Return to text. See also Batten, D. (Ed. 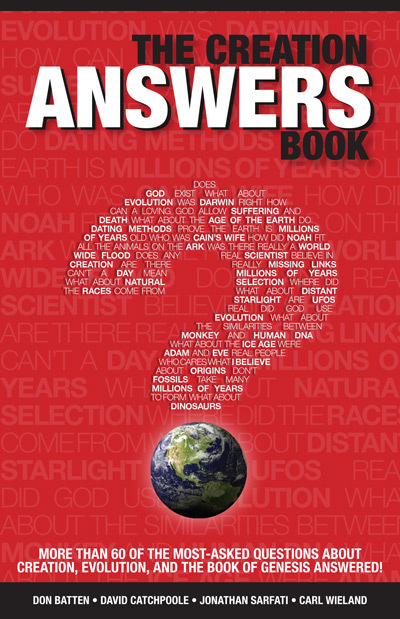 ), Ham, K., Sarfati, J. and Wieland, C., The Answers Book [now The Creation Answers Book], chapter 6, Triune Press, Brisbane, Australia, 1999; and Q&A: Death and Suffering—Curse. Return to text.